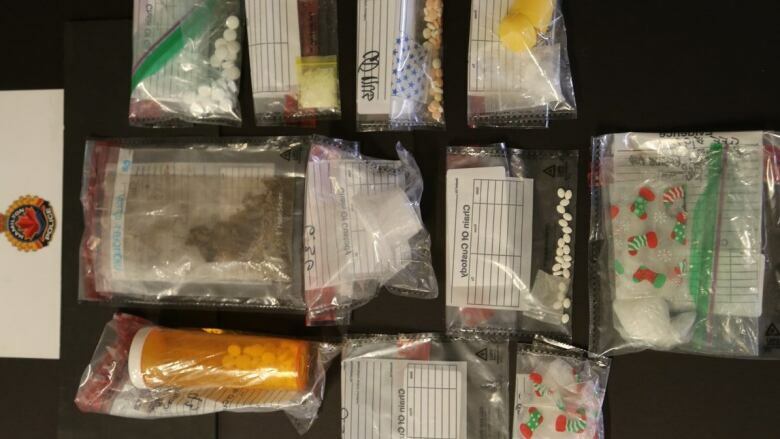 Seven people are facing drug trafficking charges after police seized cocaine, methamphetamine and fentanyl from two Hamilton houses. Investigators say community members alerted officers about a man who was allegedly trafficking drugs from his home near the corner of Dunsmure Road and Gage Avenue. Evidence to support drug trafficking. Police say the drugs have an estimated value of $4,700. A 38-year-old Hamilton man is charged with possession of cocaine, methamphetamine, oxycocet and psilocybin for the purpose of trafficking. He's also charged with possession of the proceeds of a crime under $5,000. On Feb. 9, around 12:30 p.m. police also knocked on the door of a home near the corner of Cathcart Street and Kelly Street searching for two wanted people. Police say someone opened the door and officers saw several "pieces of evidence to support the trafficking of illicit drugs" in plain view. Six people were arrested, police say. One is charged with possession of the proceeds of a crime over $5,000 and possession of fentanyl for the purpose of trafficking, another with possession of the proceeds of a crime under $5,000 along with possession of fentanyl for the purpose of trafficking. The three other people were charged with possession of fentanyl for the purpose of trafficking.